The month of February we are trying to focus on LOVING our bodies. What can we focus on to treat our bodies well? Exercising, eating well, nurturing our skin and our spirits can help us appreciate what God has blessed us with-- wonderfully made bodies. February's client spotlight is someone who has truly been an inspiration to me and many others. She is perfect for the month of LOVE Client Spotlight! Lauren McElhannon's consistent hard work and dedication to healthy living is incredible! She constantly pushes herself harder and strives to incorporate her positive energy into everything she does. She has also completely transformed her family's habits by adding yoga to their weekly routines and including healthier foods in their meals. When I asked for a picture of her this week, she said she "definitely wanted a family picture since this is such a family effort!" I love this thought, and I love watching Lauren continue to transform her life! Congrats Lauren!!! So proud of you!!! The summer of 2012 I had a 1 year old, 5 year old and 6 year old and was in a slump. I wasn’t sleeping well (lots of night waking kiddos), not exercising consistently other than a yoga class here and there, and my eating was not well planned out. Being a full -time working mom of 3 young children, not a lot of time was dedicated to me. Some of my friends were working out with Caroline and I decided to try it, even though it meant less sleep! But I was ready for a change and needed to push myself. I tend to prefer to handle change gradually (if possible) -- I’m such a creature of habit. So when Caroline said for my goal to be exercising 5 times a week, I knew that was unrealistic for me – going from 0-1 times a week to 5? No way, not right away (but definitely at some point). In my mind, I was inching toward my 5 times a week goal slowly and exercising 1-2 times a week was more do-able and realistic for me at the time. After that, exercise became a habit, I increased my days every month or so and now am exercising most days of every week! I usually go to Caroline’s 2 times a week, run 2-3 times (about 4 miles) and do yoga almost every day at home with my family, and at least 1 time a week at 5 points yoga. Now that my children are 3, 6 and 8, I’m sleeping better, exercising consistently and eating so much better. 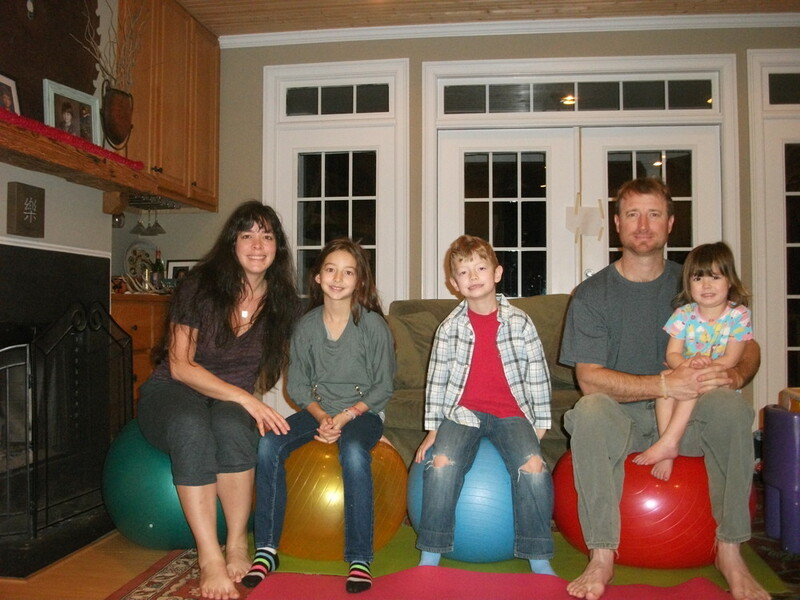 We all have our own yoga mats and exercise balls and enjoy family time exercising in the living room! For awhile there (before the cold set in), my husband and I were running a 5K a month. We liked the idea of having the event to keep us moving, to support worthy causes, and to do something fun and healthy together! We are looking forward to running the Barrow Boogie 5K at the end of February! As far as my diet and nutrition goes, when I became a parent I started paying much more attention to what I ate, what I was feeding my children, where the food came from, etc. But with children also came the snacks and crazy schedule, which ultimately led to too much snacking and rushed meals. After almost a year of working out with Caroline consistently, I wasn’t seeing the weight coming off as it should have been, so I started nutrition counseling with her, started meal planning and being very conscious of my eating (journaling). I loved the meal planning – I knew what I was supposed to eat, no big questions or concerns! I have lists of snacks/breakfasts/lunches/dinners and pull from the list every week. That way I don’t make a thoughtless choice very often! The nutrition counseling really helped me move forward with weight loss and helped me learn more about portions, balancing my diet and self-control. I have done a 3 day Journey Juice cleanse 2 times now and have encouraged so many friends and family members to try it too. By cleansing in this way, I really reflect on my eating choices, habits, reasons for eating, and feel more in control after. Tea is something that I drink daily – my mom is a medicinal herbalist, organic gardener and more, so she’s always telling me about teas I should be drinking and bringing me freshly dried herbs right over! One of my favorite mixes right now is lemongrass, holy basil and peppermint – delicious hot or cold. The nutritional benefits are amazing – lots of vitamins in these herbs! I try my best to live as green as possible, and to eat local, fresh and organic. I’ve lost weight, feel lighter, healthier and stronger now, but I still have more work to do. Currently, my goals are to keep exercising most days of the week, eat at least 8 servings of fruits/veggies a day, and to drink half my body weight in oz of water daily (and for my children to do the same). Something I like most about exercising is reaching my goal, then going further. And being excited about making new goals to conquer. I live off of lists, calendars, reminders, deadlines, so setting goals works for me – check it off the list and keep going! No extra time is what makes exercising hard. Being a working mom, there’s some guilt about spending what little extra time I have away from my children, but they and my husband are huge supporters of me on this journey! I’ve definitely rubbed off on them in positive ways – they are so much more conscious of making healthy decisions. Right now they are ON IT with our water challenge! Most days there’s something that doesn’t get done because I’ve chosen to spend a little time exercising, but I’ve learned to let that go. Exercising is THAT important to me – for my mind and body – that I’m okay with the chores never really being “done.” Are they ever anyway?? I’m so thankful for all that Caroline has helped me with! I really attribute so much of where I am today to her, her support and encouragement! Something I eat almost every day is homemade granola – I make a big batch over the weekends and eat about a cup a day. It’s great with cottage cheese, yogurt, sprinkled over oatmeal, sprinkled in pancake mix or all by itself! There are so many optional yummy things to add – make it your original! Heat oven to 300 degrees. Mix all dry ingredients. Mix wet ingredients (honey, oil and vanilla) – you’ll need to mash and chop the oil up. Pour dry ingredients into 2 large baking trays, then plop evenly the honey mixture over the dry ingredients. Put trays in oven for 2 minutes so the oil can melt a little, then take out and stir, allowing the honey mixture to coat the oat mixture. Once coated, put trays back in oven and bake 10 minutes, stir, then bake 10 more minutes. Cool granola for about 10 minutes before breaking up and placing in container. **I do not bake granola with raisins so they stay moist, I add them after granola cools. **If you like more clumps of granola, increase amount of wet ingredients to make more coating! **My favorite way of eating this is plain or 1 cup granola, 1 cup cottage cheese and ½ cup frozen or fresh blueberries (they melt quickly). Check Out My New Favorites Page!